New Delhi, Oct 23 (IANS) The spurt in violence in Afghanistan, including an attack on an army base in Kandahar, and redevelopment efforts in the war-torn country will find focus as Afghan President Ashraf Ghani arrives here on a daylong visit, coinciding with the arrival of US Secretary of State Rex Tillerson, who flies in from Islamabad. Ghani’s visit also comes close on the heels of Indian National Security Advisor Ajit Doval’s visit to Kabul on October 16 where he met the Afghan leadership, as a Quadrilateral Coordination Group (QCG) meeting was on in Muscat between the US, China, Pakistan and Afghanistan to discuss revival of peace talks with the Taliban. The visit of the Afghan President also comes as Ghani issued a directive on Sunday banning Pakistani trucks from entering his country. The Afghan Transport Ministry said that Pakistani trucks will only be allowed up to the Afghan border crossing where they will have to offload their goods and transfer them to Afghan trucks, according to Tolo News. Pakistani trucks were earlier allowed to cross into Afghanistan at Torkham and Spin Boldak borders and would then transport their goods through the borders to other Central Asian countries. “The Afghanistan and Pakistan Trade Agreement (APTA) has expired. Before this Pakistan did now allow Afghan trucks to enter its territory. So we do the same and after this Pakistani trucks will be unloaded at borders and Afghan trucks will carry the goods to Hairatan and Shir Khan ports,” a transport ministry spokesman said. Afghanistan has witnessed a bloody past week, with suicide attacks that have killed more than 150 people. Taliban suicide bombers attacked an Afghan National Army post in the southwestern province of Kandahar last week, in which 43 soldiers were killed and nine were wounded. In an attack on a Shiite mosque in Kabul 54 people were killed and 55 injured, besides other attacks. 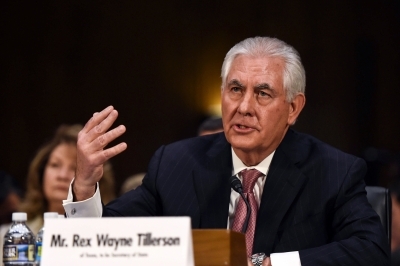 Tillerson, arriving on his maiden visit to India, had announced last week that the US wants to dramatically deepen ties with India. The top US diplomat is on a five-nation tour that includes Saudi Arabia and Pakistan. US President Donald Trump in August had outlined Washington’s reworked strategy on Afghanistan, which included a definite role for India for stabilizing the violence-wracked country. While India has said that it will not deploy Indian armed forces in Afghanistan, New Delhi has maintained that its redevelopment efforts in Afghanistan will continue. In a statement, the Ministry of External Affairs said that President Ghani, during his working visit, will meet his Indian counterpart, Ram Nath Kovind and hold delegation-level talks with Prime Minister Narendra Modi.